In my last post I talked about my inventory woes in Final Fantasy XIV. I wanted to talk about how I handle the subject in single-player games too but due to length I decided to save it for this post instead. Actually, it isn't about inventory woes in single-player games as much as in Skyrim and Fallout 4 (although this applies to pretty much every other Bethesda developed games too). Simply because most other games are, generally speaking, sensible in terms of loot and inventory. But not those two. Those two always make me into a looting monster for some reason. ...continue reading "Hoarding in Skyrim and Fallout 4"
I've been meaning to make this post for a long but didn't for.... reasons. Anyway, there is this pretty funny video made by a person called Chenova where she collected some amusing confessions from people in different forums and made a video about that. She also adds her own confessions near the end of the video too. It is a known fact that I love modding. How much? Well, right now I have about 133 .ESPs/.ESMs files enabled. Total mod files though (i.e. counting with retextures and such) is 172. But give or take a dozen for patch files and compatibility files. That is after trying to cut down on mod files. I think my record was 168 or 180 .ESPs/ESMs and an ungodly amount of total mod files. When I played my Dark Brotherhood character she married Muiri for no other reason than I thought it would be amusing for a contractor to marry the person who just murdered a few people for her. True love in Skyrim? Not in that game! My waifus in Skyrim would be Serana, Lydia and Delphine in exactly that order. I'd add Astrid too but her control freakishness might make her an interesting character but I am not sure I'd like it in a waifu. EDIT: Forgot to add one confession! To me the most dangerous creatures in Skyrim aren't the dragons. Or the Falmer. It is bears! I swear they are like ninja. They get behind you without you noticing until they are on top of you and mauling your face. My poor mage character died a lot because of bear attacks. A long time ago I did a list of mods that I use while playing Skyrim as a sort of recomendation of good mods. However that list quickly became outdated so when I pulled it down with the intention of making a new, up-to-date and improved version. Due to a suggestion of Ravanel I decided to post it in parts instead of just releasing one gigantic list at once. This will break the work in smaller chunks (making it easier for me) and allow me to gather some feedback about how to make the list as we go. Eventually I will copy the info in all the posts and make a page out of it that will be linked in the upper menu. Also, keep in mind this is not meant to be a "The Best Mods of Skyrim" list as much as a completely biased, personal list of mods I'd recommend to anyone who wants to make Skyrim more interesting. Another thing to keep in mind is that I am not a strict lore purist. I will use any mod that I feel fits enough with Skyrim or just amuses me. That means that a mod that adds Lord of the Rings weapons would work for me as they fit well enough. One that adds stuff from Legend of Zelda, not so much. So if that bothers you feel free to ignore my choices. 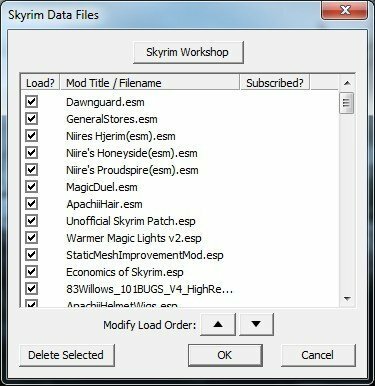 To begin with we'll won't be dealing exactly with mods but with some 3rd party software that makes playing a modded Skyrim easier. Next time it will be some real mods though! ...continue reading "My Skyrim Mod List – Part 1: Utilities"
Sofia and Lydia resting a bit while my argonian mage, Fingers-on-Fire, tries to solve a puzzle in a draugr tomb. I should have done a better job of hiding the UI there! Author RakunoPublished on August 8, 2012 May 22, 2017 4 Comments on [Skyrim] Adventures with mods! Since other people in the blogosphere have been playing Skyrim recently it seemed like it was a good idea of make a page with the mods I use. This way if anyone asks for which mod are good or what mods I use I can just point to it. It should be a lot more practical for both sides. Right now it is pretty raw, pretty much a draft still. I intent to improve on it in time by adding some screenshots/thumbnails/something-like-that and a better table of contents to make navigation easier. Eventually I intent to add pages for other games mods too like Oblivion and Morrowind. The first because I have yet to finish the main storyline on it and the second because Rebecca of a.Girl.IRL has been really tempting me to play it again. I will get to those as soon as I go back to playing them. Whenever that may be. *clears throat* Anyway, for now here is my Skyrim list of mods! In related news I've been playing Dawnguard lately and dabbling in the Creation Kit. So if it seems like I dropped of the internet, has been slower than usual or oblivious to any big news that is why. I am pretty much done with Dawnguard now on the vampire hunter side of things but still need to remake my vampire character to try the vampire side of the story. The vampire however will have to wait until I make her a secret lair with all the amenities I want. And that depends if I can submit the Creation Kit to my will. So far it is winning! In unrelated news, it seems like I missed the one year anniversary of this blog! It has been created on July 25 of last year. Where did time go?!? Unfortunately it also means I didn't prepare anything special to celebrate it. Perhaps next year. Aaand that should be all for now. Back to the Creation Kit for me! Published on August 8, 2012 May 22, 2017 Categories SkyrimTags Elder Scrolls, mod, Other Games, Single Player, Skyrim4 Comments on [Skyrim] Adventures with mods!